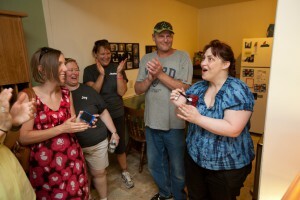 Loni and Stacey Koltes-Linberg are amazed by the work of volunteers from QBE who made over their apartment. United Way of Dane County joined with local businesses on Thursday, June 21, in the second annual Housing First Makeover Challenge to redecorate apartments for Dane County families stabilized by United Way housing strategies. Volunteer teams from Alliant Energy, University of Phoenix, and QBE competed in the Challenge, which was part of United Way’s Housing First initiative to end family homelessness in Dane County, in partnership with Meridian, owners of Northpointe Apartments where the challenge was held. The teams had four hours and could spend no more than $100 to clean, furnish and redesign the apartments using donated household items. Ashley Furniture HomeStore donated new mattress sets for the families, giving children a good night’s sleep—a crucial factor in a child’s ability to learn. Judges evaluated the apartments based on the teams’ makeovers and their response to the families’ needs. Team QBE, the Challenge winner, painted, redesigned and provided new furniture and food for a family of four. bills. Thus each of the teams made a meaningful impact for the three families by providing stability and laying the foundation for them to build successful lives. United Way’s Housing First initiative helps families achieve stable housing while addressing the other issues that contribute to their homelessness. By giving families the tools to avoid or leave emergency shelter systems and providing case management, Housing First stabilizes twice as many families at half the cost of shelters. As part of our comprehensive strategy to reduce family homelessness with community partners, United Way provides financial counseling, connections between tenants and landlords, and access to surplus food to ensure families avoid eviction. 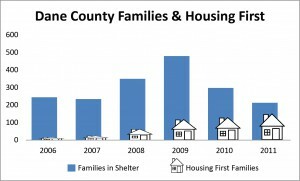 Currently 2,100 Dane County at-risk families are maintaining their stability due to United Way’s housing strategies. Our goal is to reduce the number of Dane County children in shelters by 50 percent by 2015. Volunteer teams from 10 other Dane County businesses have made over additional apartments this year. If you are interested in putting together a team contact Kathy Martinson at 608-256-4356 or kathym@uwdc.org.